Me with my sister, Chrissy, who inspired me to do this Gold Award project. 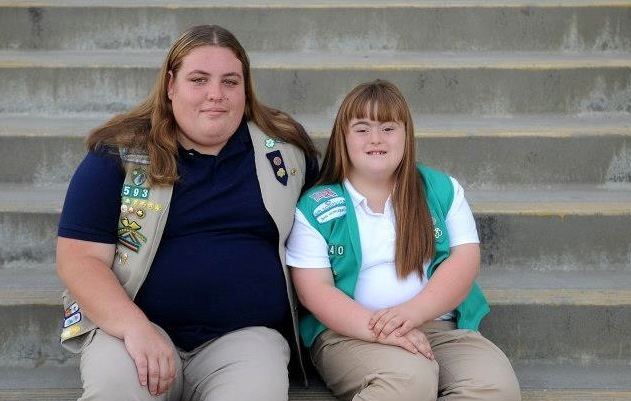 My name is Angela, I am 18 years old and a graduating senior after 13 years of Girl Scouts. This past summer I completed my Gold Award Take Action Project. My event was Kids Being Kids, a day where kids with disabilities and those without could play baseball and soccer together. My sister Chrissy lives with a disability and I have helped with my sister’s challenger baseball team for the past 6 years. In doing this I have seen firsthand how kids who do not have disabilities either look down or do not understand those with special needs. I felt there was a need to introduce regular kids to others like my sister, but in the right way. If it was not done correctly, friendships would not be made, and it would feel forced. It was important to me to teach that there is no difference between them. The sign for my event. On the day of my event I blended all of the participants together randomly into four groups. Two groups started playing soccer, while the other two played baseball. When the groups changed sports they were given the opportunity to change teams or stay on the same team. This allowed them to stay with the friends they had made or make new ones on another team. Most stayed on their original teams, but still reached out to other team members. After the games were over the participants were treated to a snack and time to talk amongst each other about the fun they had . At the end of the day, all participants received goodie bags that included shake coupons from Baker’s Drive Thru, personal pizza coupons from Shakey’s Pizza Parlor, and a box of Girl Scout cookies donated from Girl Scout Troop 340. There was also a raffle drawing and the kids could trade prizes amongst their new friends. A picture with one of my soccer kids. Being able to hold my event opened my eyes to see that this was a need in my community. A majority of the kids who participated would not have normally made the friendships they had that day. It was a great for special needs kids to participate with others on a field where everyone could be themselves and make friends. This event could not have turned out better and I am so happy I was given this opportunity to change my community. Thank You. Angela will graduate high school this year and wants to study Marine Biology in college. She plans to transfer to California State University, Monterey Bay in a couple of years.